On short notice, I must announce a long-planned, but still insufficiently prepared-for interruption in the torrent of opera-obsessed posting here. The reason is an exciting and terrifying one. I am leaving tomorrow to walk 300 miles (480 km) in about three weeks, on the Camino de Santiago in northern Spain. After that, my flatmate (faithful companion in opera-going, among other things) and I are planning to spend a little less than two weeks taking advantage of having paid for airplane tickets to our ancestral continent. Nebulous plans include Rome (hopefully with Massenet's Manon!) and Paris. Of course, the stress of writing papers and going to an enormous, exhausting academic conference has kept us from booking any sort of accommodation. So we will have adventures! and presuming I'm still in one piece, things should pick up again here in late June. I think the joke was first aired by my flatmate and fellow Ph.D. candidate as we exited Walküre: there's nothing like opera to put one's own woes into perspective. In sober truth, living in one of the non-glamorous neighborhoods of New York City is a very healthy incentive to retaining a properly humble and optimistic outlook on life. But there are still times where nothing less than Beethoven can restore my faith that, in the words of one of my favorite medieval mystics, Julian of Norwich , all manner of things shall be well. And here she is in Act III from the same production. How could anyone else fail to be a disappointment? (I do realize that I'm biased, here... but I love her, and the Sieglinde she gave last season remains in my personal shortlist of the best and most moving performances I've seen.) And how in the world could any Sieglinde who was not Waltraud Meier fail to be overshadowed by her highly-anticipated Siegmund? I was encouraged to find that Eva-Maria Westbroek, a name unfamiliar to me (which probably should count as a Really Shameful Confession), had sung a widely popular Sieglinde. An interview (which I inexplicably can't find again; sorry) left me with the impression that she was smart and feisty. So I took the YouTube plunge. All right, I'm excited. That is a fierce Sieglinde (the ecstasy escalates here.) And that (even on YouTube, through my laptop speakers) is an amazing sound. And she's beautiful. Dear God, please let her and Herr Kaufmann be in good voice when I go to hear them; please have the production leave these talented actors scope; and please let them both keep their own hair. Amen. Steiles Felsenufer. Das Meer nimmt den größten Teil der Bühne ein; weite Aussicht auf dasselbe. Die Felsen im Vordergrund bilden auf beiden Seiten Schluchten, aus denen die Echos antworten. – Finsteres Wetter; heftiger Sturm; zwischen den Felsen selbst verliert der Wind, den man in offener See die Wogen peitschen sieht, seine Macht; nur von Zeit zu Zeit scheint das Heulen des Sturms hereinzudringen. – Das Schiff Dalands hat soeben dicht am Ufer Anker geworfen; die Mannschaft ist in geräuschvoller Arbeit beschäftigt, die Segel aufzustreichen, Taue auszuwerfen u.s.w. Daland ist ans Land gegangen; er steigt auf einen Felsen und sucht landeinwärts die Gegend zu erkennen. For gorgeous early-twentieth postcards of Holländer go here. 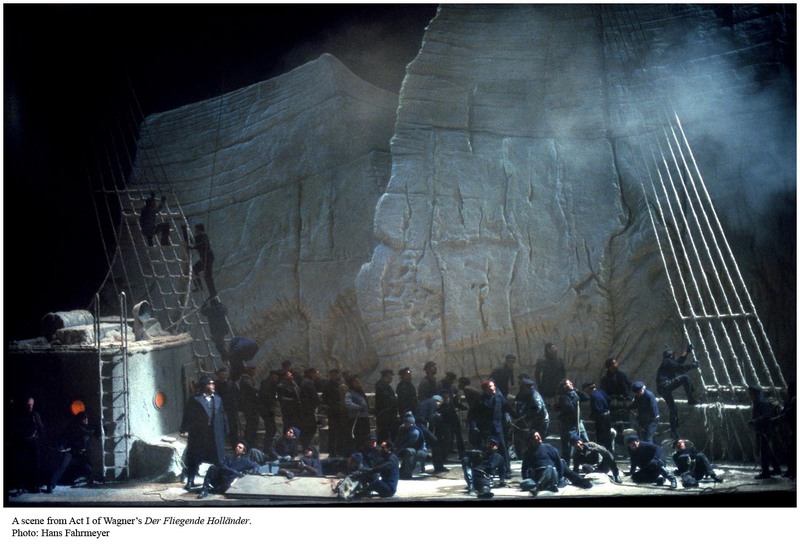 In August Everding's production, set (I believe) in the early twentieth century, the steiles Felsenufer of Act I towers over Daland's travel-weary ship and crew, but the ocean is unfortunately nowhere to be seen (as in the Met's photo, above.) 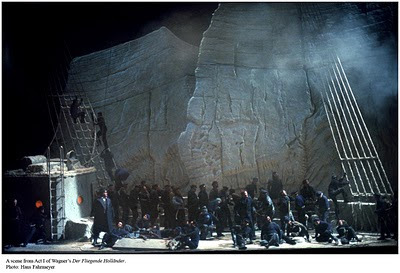 The Holländer's ship, large as a man o' war, appears out of nowhere, sinks its anchor on a blood-red chain, and sinks its landing stairs onto Daland's deck. Impressive (if lacking in obviously infernal accoutrements.) Act II has a bare room full of treadle sewing machines and cloth-covered tables, with Mary shrilly and sententiously supervising productivity. I always pictured the Spinning Chorus much cozier, but ah well. Act III had a celebration on the steps leading down to the pier, with Daland's house mysteriously under the said steps. (Parenthetically, what Norwegian celebration involves dancing, large jack-o-lantern masks and copious quantities of wine? Christmas?) So far, so good (if unremarkable.) But the blocking (or lack thereof) was, I thought, deeply problematic. Wouldn't Daland be somewhat suspicious of a prospective son-in-law who never looks him in the eye? Wouldn't Senta's fixation on the portrait be more effective if there were more general movement and interaction? Surely it is hardly revolutionary to suggest that the drama of Senta and the Holländer standing wie gebannt on opposite sides of the room and staring fixedly at each other would be much more effective if this were not what everyone is doing with everyone else all the time. Although Carmen is still under my skin, I had a pleasant musical interlude on Saturday: the graduate recital of one my oldest friends, no less! A soprano, she chose madness as the theme of her recital, and it was tremendous fun, as well as, for me, a surprising experience to sit and hear someone whom I know quite well open their mouth, strike an attitude, and create a vivid characterization through difficult repertoire. (I have talented friends... so thrilling!) A standout was, unsurprisingly, the mad scene of Ambroise Thomas' Ophelie; you can find Mady Mesplé singing it here. I still remember listening to Ballo for the first time, absolutely cold, and thinking: Oscar, no, don't taunt him; you're going to die!!! I do believe that Ballo was the opera which started me on the path to Verdi-love, first through the recording above, and then through Callas, Di Stefano, and Bastianini live at La Scala. A few clicks of research reveal that this production only seems to be available on DVD under less-than-completely-official circumstances. It also appears to be on YouTube, having been broadcast on French television. All very mysterious. Strauss discoveries and Verdi productions are all I have for now, except for a very warm welcome to readers who have found their way here from the Carmen review at Likely Impossibilities (recommended generally for a more musically savvy and hilariously irreverent take on all things operatic than my own.) I hope you stick around (and say hello, if you feel like it.) If you have found your way to this post while searching for reviews of Jonas Kaufmann's recent performances at the Met, here are my Tosca and Carmen reviews; Carmen now has audio, thanks to YouTube user Macbett0. Wenn deutsche Zusammenfassungen oder Übersetzungen von diesen (oder sogar anderen!) Rezensionen wunschenswert wären, bitte sagen Sie es in den "Comments"! A closing tidbit: at the reception on Saturday, I was asked by a friendly acquaintance (with whom I was animatedly discussing Jon Vickers), "Warum bist du keine Musikerin? Du strahlst ja!" Why am I not a musician, when opera (apparently) makes me glow? Well, the answer to that question is possibly that, when I was supposed to be practicing the piano, there was always a book I wanted to be reading. So I turned into an opera-going medievalist. ...I'm still not sure whether I'm excited or afraid, but I think I'm excited. And I like the costumes.